What a year 1996 was: a computer beat a man at chess, we cloned a sheep and we almost won a football tournament too (we still can’t look at Gareth Southgate without welling up…). To top it all off, these classic video games were released too! Super Mario 64 is one of the greatest video games ever made, and easily one of the most influential too. It was one of the first fully 3D platformers and one of the first major games to offer open-world exploration, inspiring everything from Grand Theft Auto to Minecraft. At the time, though, it was just a brilliant game about everyone’s favourite portly plumber saving Princess Peach from Bowser again. Seriously, will someone get that woman a team of bodyguards or something? It also posed one of gaming’s greatest challenges: collecting all 120 stars. And even that wasn’t enough for some people; despite such a mammoth task, people are still trying to find ways to play the game for longer. We don’t blame them. 1996 brought us not one but two amazing Mario games, with the first 3D Mario Kart hitting the N64. With an extra dimension came new and innovative ways of making you want to chuck your controller through a window, such as traps, blockades and the most difficult Rainbow Road ever, as well as classic irritants like red shells and banana skins. Time hasn’t been that kind to this one unfortunately, and we reckon it’s one of the weaker games in the series. It was the first stepping stone towards the amazing Double Dash and Mario Kart 8 though, so we won’t complain too much. While Super Mario 64 was undoubtedly one of the best games ever, not everyone was into that cheery day-glo vibe. The edgier PlayStation needed an edgy mascot; enter Crash Bandicoot. 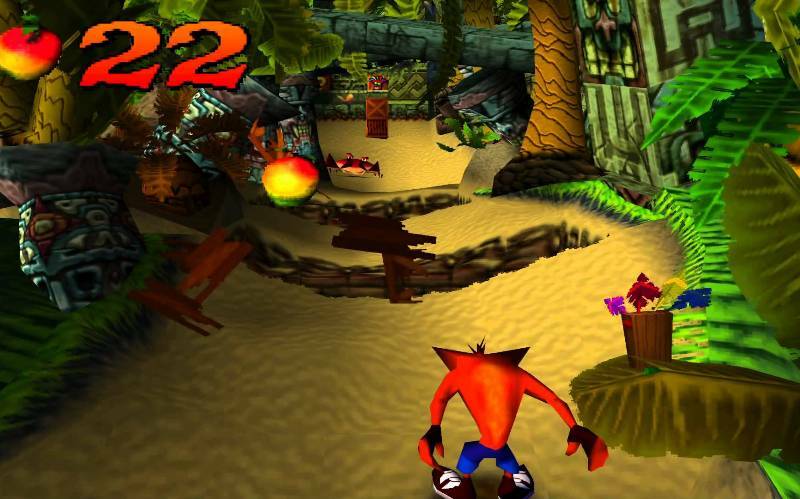 Crash was a bit cheekier and a bit cooler than Mario, throwing knowing winks to the audience while he tore through levels gobbling wumpa fruits on his way to stop Dr. Neo Cortex from taking over the world. He was also mates with a mask called Aku Aku, or Ugga Ugga as a generation of pre-teens knew him. While Crash Bandicoot was nowhere near as good as Super Mario 64 (argue with that in the comments! ), it has left as much of an impression on the minds of gamers brought up on the PlayStation. Sadly, things didn’t work out quite as well for Crash as they did for Mario. After two decent sequels and a brilliant kart racer, Crash starred in a series of increasingly bad games and now appears to be done altogether. There are rumours of Activision (who own the rights) or Sony bringing him back, but no-one seems to be in a rush to make it happen. Naughty Dog, meanwhile, has gone on to become one of the world’s best games studios thanks to Uncharted and The Last of Us. Perhaps they fancy introducing Crash to a new generation? Where would we be without Quake? Well, there’d be a lot less kids swearing at each other on Call of Duty for a start. This spiritual sequel to Doom helped popularise online multiplayer, becoming one of the first games to have its own real-world tournament. The edgy tone and HP Lovecraft-inspired plot has been aped by countless other games too, although none have done it quite as effectively. Basically, this is one of the most important games ever to be released, even though it feels extremely primitive compared to today’s ultra realistic military shooter. Oh, and here’s a fun fact: the soundtrack was compared by none other than Trent Reznor, the Nine Inch Nails mastermind who went on to win an Oscar for his work on The Social Network. Before the world of gaming was brought together by the magic of broadband, people had to go to each other’s houses’ to play against each other. It was in this world that Tekken 2 existed, and it was glorious. While the plot is pretty hilarious – there’s some plot about an international corporation being super evil and summoning the devil or something – the game itself is nothing short of incredible. The premise is simple: you pick a fighter from a cast of characters including a man with a leopard head, a rip off of Bruce Lee and the phenomenon known as Paul Phoenix and beat the living daylights out of everything that stands in your way. There was combos and complexity, but let’s be honest: most people just bashed buttons and hoped for the best. And those people usually won too, to the fury of anyone who actually bothered mastering a character’s special moves. Believe it or not, it took the team behind Tekken 2 between 3 days and a week to model each character. They look like lego men now, but the 3D models were seriously impressive back in the day. Die Hard Trilogy is one of the best value games ever, with 3 games for the price of one! The first Die Hard took the form of a third person shooter in which John McClane has to climb up a tower filled with terrorists while wearing a dirty vest. Well, it was kind of John McClane: the team behind the game didn’t actually have the rights to use Bruce Willis’ face in the game, and therefore had to create a model of a bloke who looks a bit like him. Die Harder, meanwhile, was a first person shooter like Time Crisis. The aim was to shoot as many of those pesky terrorists as possible, and there was a lot of terrorists. This one was especially fun with the G-Con 45 lightgun, which allowed you to jump around your room pretending you were John McClane. Die Hard With A Vengeance took the form of a driving game in which you had to speed around disarming bombs. You could also run people over, which led to McClane wiping their blood off his windscreen while letting out a nonchalant ‘sorry’, which was disturbingly hilarious (and utterly, utterly wrong). In short, there was something for everyone. Well, everyone who liked shooting loads of baddies while wearing off-white undergarments at least. Red Alert was the king of real time strategies, allowing you to build armies, command them in battle and sit back smugly while you crush your enemies with your sheer brilliance. The best part of Red Alert, though, was the utterly bonkers plot. It begins with Albert Einstein sending himself back in time to meet Adolf Hitler and stop him becoming the leader of Nazi Germany. This creates an alternative timeline where Stalin and the Soviet Union become superpowerful and take over most of Europe. Depending on which side you choose, you either have to stop the Soviets or help them take over the rest of the world. We won’t spoil the ending, but let’s just say it gets even more bizarre by the end. 20 years later, it’s still one of the best set-ups to a game ever. At the time, the answer seemed to be a resounding yes. Lara Croft became an overnight sensation and helped Tomb Raider become one of the most popular PlayStation games ever. Of course, the game itself was amazing too, with huge amounts of exploration and some mind-twisting puzzles to solve along the way. 20 years later, Lara Croft has now been reinvented as a mature and distinctly more feminist character and the Tomb Raider series is as good as it’s ever been. What was your favourite game from 1996 (if you were born then…)? Let us know in the comments. If you need to sell games, try us! We’ll give you an instant price, send a FREE courier to collect your stuff and pay on the same day your items arrive. Just click below to get started.